A complete reimagining of the 1990s television hit Clarissa Explains It All as 20-something Clarissa tries to navigate the unemployment line, mompreneurs, and the collision of two people in love. She was a smart, snappy, lighthearted girl who knew it all at 14 and let television audiences everywhere know it. Now a woman in her late 20s, her searching blue eyes are more serious but mostly amused by the people around her. The gap-toothed smile that made her seem younger than she really was is gone, but she still lightens up the room. Her unpredictable wardrobe rocks just like when she was a kid, but her fashion sense has evolved, and it makes men and women turn their heads. After leaving high school early, Clarissa interned at the Daily Post while attending night school. At the ripe old age of 22 she had it made - her own journalism beat (fashion, gender politics, and crime), an affordable apartment in FiDi, and a livable wage. She was so totally ahead of the game. Ah, those were the days! All three of them. Remember the stock market crash of '08? Remember when people actually bought newspapers? All of Clarissa's charming obsessions, charts, graphs, and superstitions have survived into adulthood, but they've evolved into an ever-greater need to claw the world back under control. Her mid-20s crisis has left her with a whole set of things she can't explain: an ex-boyfriend turned stalker, her parents' divorce, a micro relationship with the cute coffee guy, java addiction, "To-Flue Glue", and then there's Sam. Where's Sam anyway? Things I Can't Explain is about knowing it all in your teens and then feeling like you know nothing in your 20s. 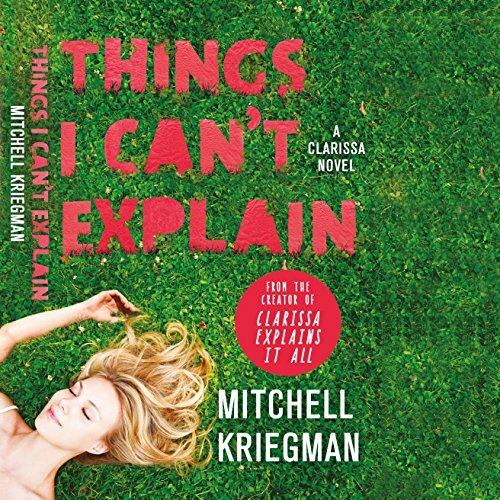 It is an entertaining and must-listen sequel for all fans of Mitchell Kriegman's Nickelodeon TV show Clarissa Explains It All. ©2015 Mitchell Kriegman (P)2016 Audible, Inc. I was excited to download this since it was a spiritual successor to one of my favorite shows growing up. The story was rushed at times (especially the end), the narration was not edited well (at one point she asked to start over so she could clear her throat), and it was just a let down all around. I didn't like the way the author made Clarissa out to be some wilting flower. I grew up with her being a strong girl. Not some sad woman hiding out in her apartment pining over a boy. If there's a sequel, I'm hoping they make her a little stronger. May be, you childhood heroes shouldn't ever grow up:) It's hard to see them cursing and having sexlife. The ending is too crumpled and abridged. A great take on a classic show. Would you consider the audio edition of Things I Can't Explain to be better than the print version? I would, due to the narration. Clarissa herself, being the main character. What about Emily Madar’s performance did you like? She's great with accents, among other things. If you could rename Things I Can't Explain, what would you call it? Afraid I can't think of an alternate title. A must-have for fans of Clarissa Explains It All. Poorly edited to the point where the actress will stop mid sentence speak to the producer and then redo the line. The story itself is weak, goes no where and the final act is beyond silly / cringe worthy and just badly done. Fans of Clarissa should just look up fan fiction because that has to be better than this official garbage.